Let Jasmin and the pros from Jasmin Reese Interiors fill you in on the fall trends. The recent fall chill has us wanting to snuggle up with a glass of wine and a book at home, now that the season of bike rides and rooftop barbecues has come to an end. We’re inspired by the power of the color red to bring vitality and warmth to interior spaces this season. Take a look at some ways to use the bold hue around your home for dramatic and beautiful effects! Reds works well in the coziest places in your home, such as libraries, bedrooms and dining rooms. The cheery red paint on this living room gallery wall creates a stunning contrast for the white matted photography, simultaneously adding a touch of formality and warmth. You can use red in larger rooms to warm up a space and unify a design, rather than cooler tones you might choose for smaller spaces to make them appear larger. This lavish guest bedroom’s muted red and gold patterned wallpaper is complemented by the sumptuous velvet headboard and luxe fur bed cover, and is given an extra touch of class from a classic red leather ottoman. 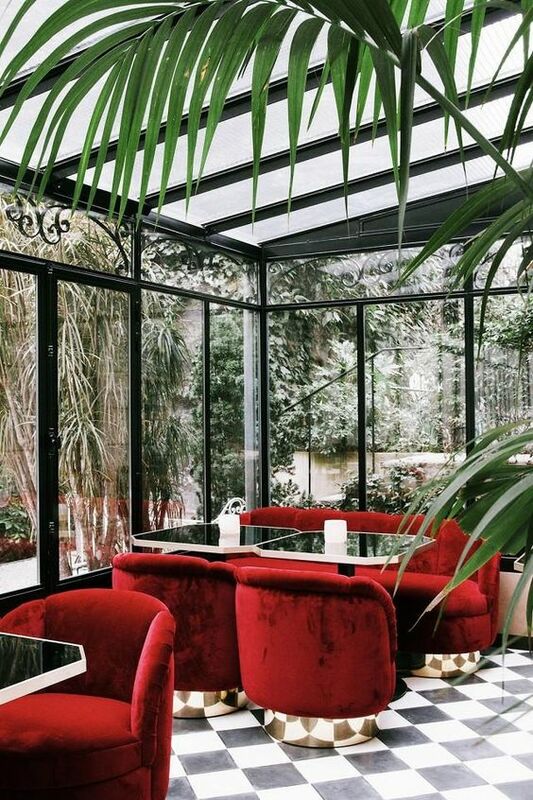 We absolutely adore the unapologetic luxury of these crushed red velvet chairs, adding warmth and style to this cool, airy Paris conservatory. The romantic red furniture paired with the sharp contrast of the simple black and white tile floor is fabulous. You might take this inspiration to your kitchen and get a similarly striking effect by pairing vibrant red cabinets with a geometric black and white tile backsplash, and of course lots of plants! In the feng shui tradition, red is said to be best for dining rooms because the fiery color can raise one’s blood pressure and heart rate, and may serve to stimulate conversation and connection. 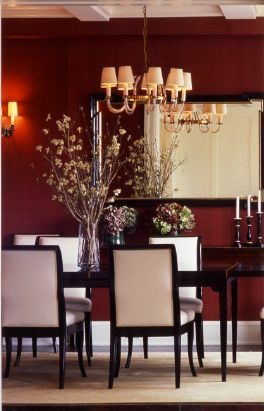 We couldn’t agree more with this theory, and have found that reds work especially well in social spaces, like this formal dining room with deep berry walls and dark wood furniture. The gentle glow of the wall sconces complete the inviting feel. Pantone’s Color of the Year in 2015 was a lovely soft purplish red called Marsala, which offers a strikingly elegant backdrop for this gorgeous white stone hearth. Here are our paint selects for autumn reds: Sherwin Williams Real Red is a great selection for a brighter tone, or Benjamin Moore Mediterranean Spice for a softer shade. There are lots of powerful ways to use red in your interior space to create a daring contemporary look or a homey, welcoming vibe. If you’re not ready to dive in by painting your entire walls red, try painting just the molding and trim in a room, or adding some pieces of red furniture and flowers around your home! Need help finding just the right red? Call us for a free color consultation.